Make beautiful brows an essential part of your makeup routine with the new Sigma Beauty Expert – Brow Design Kit! This revolutionary kit contains all of the arching, shaping and grooming tools you need to achieve your perfect brow look. The Brow Design Kit contains 15 pieces to define and design your brows. The kit features: A scissors, a tweezers, 3 brow stencils (small, medium and large), a dual ended highlight pencil (matte and shimmer), a dual ended brow pencil (medium and dark), a pencil sharpener, 5 brow powder shades, dual ended brow gel (clear and tinted) and a dual ended brow brush (E75 and E80). 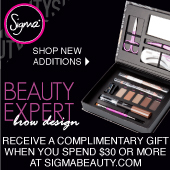 The Brow Design Kit is now available for $69 through the Sigma Beauty website. To update your blog with one of the affiliate banners below, simply save the image to your computer, upload it as a picture to your blog and insert your affiliate link as the URL. The launch of the Brow Design Kit has been highly anticipated, so don’t miss out on the opportunity to market this product. 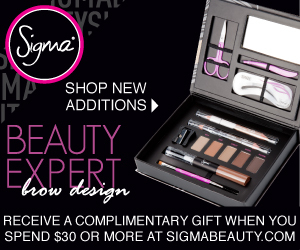 Share the Sigma Beauty Expert – Brow Design Kit information today! This looks like a great product!! I have struggled being able to put my banners up on my youtube channel with the new youtube layout - any suggestions? Of course! Thanks for stopping by the blog! Thank you! We're very excited about this new kit! I have share it with my readers too =) Such a useful kit! Hi Amna! A Tax ID/SSN is only needed for US citizens. For all international affiliates, you can simply enter 123! Meet our new Rising Star!